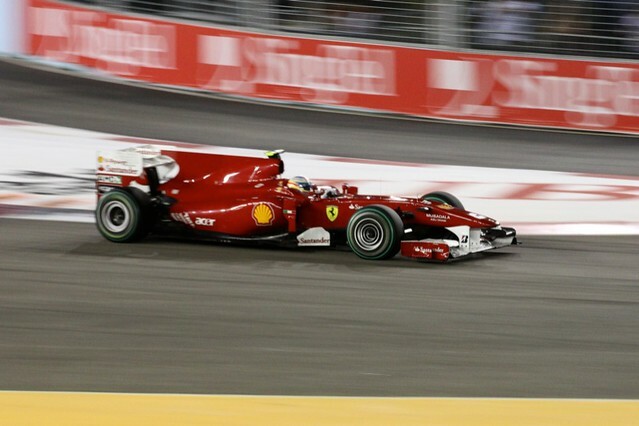 Fernando won another battle in Singapore but is he also winning a larger, psychological war? Certainly he took the fight to Red Bull and Mclaren all week end, being very aggressive even in practice while playing the underdog with the press. He repeated that it's the leaders who are under pressure not to make mistakes. 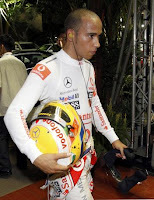 I wonder if his first victim was not Lewis Hamilton, I have never heard him sounding so depressed and defeatist as he was after his retirement. Interviewed, Lewis really sounded like he meant it when he despaired about his chances in the championship and somewhat melodramatically added a wish for Button's success. Snap out of it dude! Hamilton is only 21 points out of the lead with 100 still in play, anything can happen. As far as the incident with Webber, I'll be interested in your comments. I saw it as a racing incident. Watching the replays, Hamilton will wish he had given a few extra inches to Webber as Kubica did when he pulled off the same move on Sutil, in the same corner. There was no absolute need to shut the door like that as the following turn was a right. Lewis' explanation that he did not know Webber would be there doesn't really cut it, he really should have figured Webber, who would not even yield for his team mate, would very much "be there". Did Hamilton really think Webber would be a pushover like Button was at the start, when he had easilly passed Lewis only to back down under braking and getting passed on the outside? I don't think so. In the end it was the two championship championship leaders fighting for supremacy on track, what more can anyone want? Webber was very lucky, not just that his suspension did not break and his tire did not burst but that the Red Bull strategy risk paid off thanks to a second Safety Car period. Third after being uncompetitive for most of the week end is very good for him. Meanwhile with Vettel Red Bull had its hand forced by Ferrari when they pitted on the same lap as Alonso. Vettel also made an error in his pit stop when he tried to pull out in second gear and almost stalled. Four to go, five still in play, the story line of the 2010 championship is getting better and better, I think the winner will need to be not just fast but cool as a cucumber. I'd be interested to know the outcome had McLaren put Hamilton and Button on soft tyres at the first pit-stop. Webber had showed that the hards were taking ages to come good and the ageing softs were still several seconds a lap faster. Kubica also showed what could be done on fresh softs. Perhaps 20 laps might have got them the required 30 seconds for a late pit for the hards and leap frog Webber at least? @Danny: Kubika was on "hard" tires when he charged through the field. also the Mclarens since they started on "soft" had no choice but to move to the "hard". Nobody could afford 2 stops. @AC I realise they were on softs, just pondering whether that would have given them enough advantage to overtake and build up sufficient gap to allow for a late second pit for the hards? I seem to remember Webber on the new hard tyres being almost 3 seconds a lap slower than Alonso etc on old soft tyres about 20 laps into the race. But then I'm no F1 strategist! Did you guys see Webber's wheel/tire after the race?